"Certainly many painters who do not use perspective have also been the object of praise; however, they were praised with faulty judgement by men with no knowledge of the value of this art." Piero della Francesca harnessed mathematical theory and geometry, combining them with Renaissance humanism, to create some of the most arresting religious paintings of the early Renaissance. His use of linear perspective and foreshortening brought biblical scenes and legends to life, and his emulation of classical figures and compositions lend his paintings a stability and gravitas even if their subjects are often mysterious. 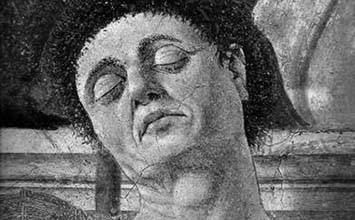 Now celebrated as one of the most important Italian painters of the quattrocento (15th century), Piero della Francesca languished in obscurity for several centuries. While he did not inspire many artists during the Renaissance, the quiet grandeur and precision of his paintings spoke to a host of 20th-century avant-garde artists from Georges Seurat and Giorgio de Chirico to Balthus and Philip Guston. Piero della Francesca's abiding interest in mathematics led him, along with Masaccio and Brunelleschi, to create illusionistic spaces in which ideally proportioned and sized human beings enacted religious and secular events. This rationalized space reflected a humanistic world view in which human beings were the measure of all things. The renaissance of classical antiquity in the 15th century meant an abandonment of many medieval conventions and an emphasis on solid human forms grounded in an illusionistic space Despite this new substantiality, Piero's paintings still possess an atmosphere of otherworldliness due to his color palette and stillness of his figures. While Piero della Francesca painted many altarpieces and frescoes that decorated church interiors, he benefited greatly from a burgeoning secular patronage. Led by the new wealthy merchant class, these patrons commissioned artists like Piero in hopes of cementing their status through visual displays of wealth and importance. Around the year 1420, in the small Tuscan town of Borgo San Sepolcro, Piero della Francesca was born to Romana and Benedetto dell Francesca. His parents were merchants who plied their trade in leather and wool, through which they made a substantial living, and both of their families had a noble lineage. Piero was his parents' third child, and he likely would have attended school in his town where, according to 16th-century historian Giorgio Vasari, he applied himself to mathematics in particular. Commissioned in 1445 by a Catholic confraternity, this polyptych was one of Piero della Francesco's earliest commissions; however, despite the three year goal set by his patrons, Piero took 17 years to complete the painting, slowly working on it as he took on other projects. Given its large size, the polyptych was probably intended to be used as an altarpiece. At the center of the polyptych is the Madonna della Misericordia (Madonna of Mercy), to which the commissioning confraternity was dedicated. This iconography of the merciful Madonna sheltering the faithful under her cape was extremely popular in medieval Italy and can be traced back to the 13th century. Often the kneeling figures under her cape would represent the patrons of the work, and in this case members of the confraternity are shown. To her right and left are Sts. Sebastian, John the Baptist, Andrew, and Bernadino. The tympanum above includes Christ's crucifixion in the center flanked by St. Benedict, the angel Gabriel, the Madonna of the Annunciation, and St. Francis. The predella at the bottom of the altarpiece contains scenes from the life of Christ and was painted by assistants. One can see the influences of Masaccio, especially in the crucifixion scene, as well as Brunelleschi, but this polyptych encapsulates the stark simplicity and geometrical exactitude for which Piero della Francesca is most known. The form of the Madonna is almost perfectly symmetrical and is in itself formed of a series of geometrical shapes: her head is a perfect oval, her neck is cylindrical, and the folds of her robes are comprised of triangular forms and parallel lines. The gold background, a specific request of the confraternity, forced Piero to abandon the landscaped backgrounds, of which he was so fond. In a response to this restriction, Piero created space with the figures themselves. For example, the Madonna's curved robes echo an apse, an architecturally significant part of church designs, and Piero foreshortened the feet of the four saints on either side of her, suggesting that they are standing in a physical space instead of the featureless gold field. The use of limited colors as well as simple geometrical shapes give the polyptych an almost modern sense of "unreality" that prompts solemn contemplation on the part of the spectator. A serene, classically posed Christ stands in the center of the painting with his hands in a gesture of prayer while St. John the Baptist pours water from a shell onto Christ's head, thus baptizing him. A group of three angels stands to the left behind a slender tree, and to the right, slightly further in the background, one sees another figure disrobing, preparing for baptism. The background landscape calls to mind the area around Piero's Tuscan hometown of Borgo San Sepolcro. Piero's trademark landscapes, simplified forms, and symbolic geometry can all be found in this early work. The Baptism of Christ was originally the central panel of an altarpiece commissioned for the chapel of St. John the Baptist in an abbey in Borgo San Sepolcro and flanked by two other panels painted by Matteo di Giovanni. It is likely that above the central panel there was a roundel that depicted God, thus completing the symbolism of the Trinity: God the Father, the Holy Spirit (depicted as a dove), and Christ. During the Christian rite of baptism, the Holy Spirit enters the individual, marking him or her as a child of God. The statuesque poses of the figures and the separation of the groups lends a sense of stillness and quiet to the panting, captivating viewers since its relocation to London in the late 19th century. American artist Philip Guston wrote in 1965, "In The Baptism of Christ, we are suspended between the order we see and an apprehension that everything may again move." The Death of Adam forms part of a large fresco cycle, The Legend of the True Cross, painted by Piero in the Basilica of San Francesco in Arezzo. He was commissioned to complete the fresco after the artist Bicci di Lorenzo died before finishing the original commission. On the right, an old, dying Adam, the first human created by God, implores his son Seth to visit the archangel Michael to acquire an oil that will prevent his death. In the center of the composition in the far background, we see that Michael instead gives Seth a seed of the Tree of Sin to place in his dying father's mouth in order to save his soul. Eventually, the Tree of Good and Evil would sprout from him, perhaps represented by the large tree in the center of the fresco. On the left, Adam's family bury him. In medieval times, Adam's death was in many ways seen as the beginning of Christ's story, as it was believed that the wood for the cross that Jesus was crucified on came from the Tree of Good and Evil. The story of the True Cross of Christ, and its rediscovery by the mother of Byzantine emperor Constantine the Great, was particularly important in this period when efforts were being made to unite the Western and Eastern churches. Piero's famous geometry is crucial to the painting's composition. The tree forms a column at the perfect center of the painting, branching out into the clear sky. The monochromatic handling of color and triangular compositions in the groupings of figures give the painting a sense of visual unity. Even though three narrative stages are shown in the painting, Piero managed to make each scene seamlessly fit together in one continuous landscape. The pale and monochromatic palette of this painting, along with the geometrical shapes created by the bodies of figures, influenced several 20th-century artists, particularly Balthus. Possibly the most famous of Piero's works, this small panel was painted for Duke of Urbino. To the left in the background, Christ stands in a columned interior, being whipped before the Roman Pilate before his ultimate crucifixion. To the right in the foreground, three men in Renaissance garb stand in conversation, either ignorant or unaware of the action behind them. This enigmatic scene has prompted much debate among art historians about what exactly is being depicted, the identities of the three men in the foreground, and why Piero placed the scene of flagellation, presumably the main subject of the painting, in the background. Even with the various interpretations that stress political or theological analyses, everyone agrees on Piero's magisterial use of linear perspective to create the mysterious scene. The receding of the floor tiles extends deep into the picture, allowing the spectator to imagine that she could take a few steps forward and enter the scene. Even if the two scenes take place at different historical moments, as suggested by some theories, the two are joined in occupying the interior and exterior of the same space. Piero's rendering of the floor and columns is so accurate that scholars have reconstruct the full space depicted in the painting. Art historian Frederick Hartt called this painting "the ultimate realisation of the ideals of the second Renaissance period," and the impact of Piero's perspectival composition and the cryptic and inscrutable subject can be seen in the 20th-century Surrealist paintings of Giorgio de Chirico. Originally painted on the wall of the civic hall in Piero's hometown of Borgo San Sepolcro, this fresco was hailed a century later by Giorgio Vasari as Piero's best work. It shows four soldiers sleeping in front of the tomb of Christ, as he climbs up onto it after his resurrection. This painting was particularly important to the town, since it is connected to its founding myth. Two pilgrims from the Holy Land supposedly fell asleep by a tree, much like the soldiers in the painting, and upon awakening they found that the stone they had brought back from the tomb of Christ had miraculously risen up into the tree. They decided to found a town at that spot, named Borgo San Sepolcro after the Holy Sepulchre (tomb of Christ). Piero's Crhist was eventually incorporated into the town's coat of arms. The use of space in this painting is particularly captivating. Piero creates a realistic space with a landscape of a Tuscan village that extends behind Christ, but the figures before the tomb are pressed right up to the surface of the picture plane, giving the illusion that Christ, whose foot rests upon the top of the tomb, is about to step out of the picture itself. This illusion makes the viewer feel she is present at this frozen moment in time, and it is heightened by Christ's direct gaze. To further place the scene in the original viewers' present space and time, Piero dresses the Roman soldiers in contemporary, 15th-century dress. For many years this painting was largely unknown to those who had not visited Borgo San Sepolcro, but it began to receive attention in the late 19th century. The pyramidal compositions of the soldiers and the stillness of the scene inspired Georges Seurat's Bathers at Asnières (1884), and in particular Seurat posed one of the bathers to echo Piero's leftmost figure. A few decades later, writer Aldous Huxley called it "the greatest picture in the world." Commissioned by Federico da Montefeltro, Duke of Urbino, this diptych shows the Duke and his wife Battista Sforza facing one another in profile, and a continuous landscape with a low horizon extends behind them. The Duke of Urbino was one of Piero's most important patrons. Piero painted, among other paintings, The Flagellation of Christ for the Duke and dedicated a treatise on perspective to him. Profile portraits were very popular at the time as they evoked images on ancient coins and hearkened back to the legend of the first portrait, a traced silhouette on a wall. 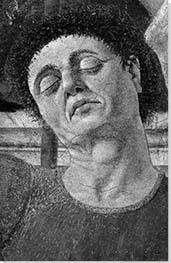 This format also suited Federico's preference for being painted from his left side due to a facial disfigurement that he sustained in battle. Piero subtly communicates the pair's powerful positions and personality without betraying their emotions. The two figures offer a notable contrast to one another. The Duchess is painted with the smooth skin and pallor associated with refined women of the time, and her hair is intricately plaited and accessorized in the latest fashion. The Duke, however, is shown as a far less attractive figure by Renaissance standards. His skin is tanned, wrinkled, and spattered with warts, and the heavy set of his eyes and profile of his nose are unabashedly displayed, with his plain red clothing doing little to distract from his face. These features, though, highlight his wisdom, strength, bravery, and experience, and the red clothes signify his papal connections. The seemingly disparate pair are brought together by their eye contact as well as the continuation of the rolling hills in the landscape behind them. Piero emphasizes the united front of the couple as elite leaders in society by painting on the reverse of the panels an allegorical scene of the Duke and Duchess each in a triumphal chariot surrounded by virtues. Much like the appearance of the figures on the front, these correlate to their genders and roles; the Duke is surrounded by the virtues of Wisdom, Valour, Justice, and Moderation, while the Duchess sits in the company of Faith, Hope, and Charity.